Barry Pennypacker (L), Manitowoc Cranes, and I.H. Kim, Shinwoo Development Co.
Manitowoc held a customer recognition ceremony for Shinwoo Development Co. at bauma 2019 in Munich, Germany. 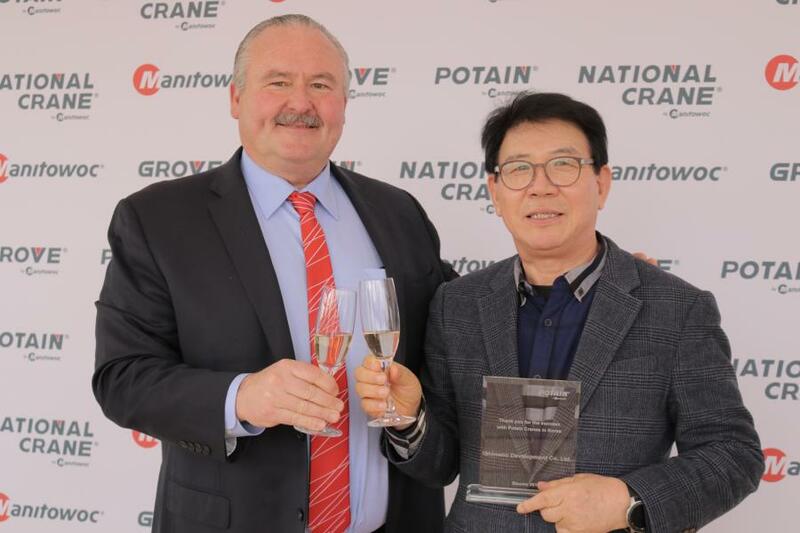 Barry Pennypacker, president and CEO of Manitowoc Cranes, presented the South Korean company with a celebratory plaque for the occasion, and expressed gratitude to Shinwoo Development Co. president I.H. Kim for the company's contribution to the success of Potain tower cranes in the region. "Shinwoo Development Co. is one of our most valuable partners and we thank the company for its commitment to Potain tower cranes," Pennypacker said. "Together here at bauma 2019, we toast to good health and good business in the future."